Want to quickly see how the open-source software phpBB works? You'll find a free and updated demo installation of phpBB here. PhpBB (PHP Bulletin Board) is a free open source Internet forum package written in the PHP programming language. The software includes support for multiple database engines like PostgreSQL, SQLite, MySQL, Oracle Database and Microsoft SQL Server. The project was started by James Atkinson as a forum for his own website on June 17, 2000 and soon after that other developers joined in. Version 1.0.0 was released just a few months later, on December 16, 2000. In February 2001 phpBB began development entirely from scratch bringing new features to the software and opening the way to many future improvements with each version released. 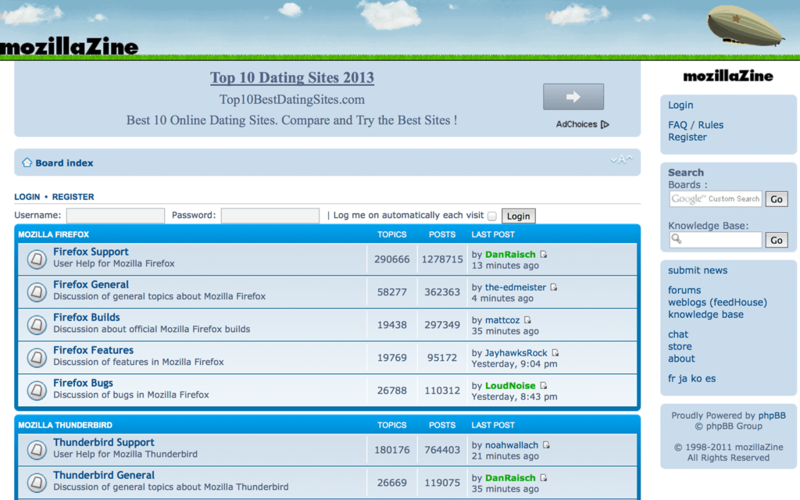 Using phpBB as a forum allows you to create your own online community that is fully scalable and highly customizable. Some phpBB examples of features include a flat message structure, hierarchical subforums, user groups and multiple attachments per post. phpBB leads the industry in security and offers multiple tools that help you fight spam and keep away unwanted users. If you want to try phpBB online and get a complete phpBB review you can click on the links above and login to our phpBB forum demo. After you login to the backend you will be redirected to the phpBB admin panel. Given that our phpBB demo is a fresh install of the software, the first things you’ll see are your forum categories, who is online and statistics. You can use the Quick links menu at the post to navigate through posts, active topics and manage members. The screenshots below will give you a preview of how an admin demo looks like, but you can use the FAQ menu at the top to search for answers, especially if you are a first time user. You can also set up your own phpBB demo if you click on the link below to download the software and then go through the install process. The latest version available for download is 3.2.2 and was released on January 7, 2018 under the GNU General Public License. phpBB 3.2.x has a few requirements which must be met before you are able to install and use it. You will need a webserver with at least a version of PHP 5.4.7 installed with support for the database you intend to use. In terms of a database system you can use one of the following: MySQL 3.23 or above (MySQLi supported), MariaDB 5.1 or above, PostgreSQL 8.3+, SQLite 3.6.15+, MS SQL Server 2000 or above (via ODBC or the native adapter) or Oracle. The best thing you can do before setting up your phpBB demo is find a tutorial online that explains all the steps you need to follow to install the software. The documentation on their website explains everything you need to know for a successful demo installation. This way you won’t run into any problems and your online demo will be up and running in no time. When it comes to customizing your phpBB forum demo, you should know there aren’t any predefined phpBB themes available, but you can install and create styles for phpBB3 that will change its design. You can also expand current features by installing new extensions, modules and plugins that will add more functionality to your phpBB demo site. All documentation regarding downloading, installing and creating new extensions for phpBB is available on their official website. Given that this is a project supported by a community of developers, contributions are also encouraged. The features provided by phpBB make it the most widely used open source bulletin board system in the world. 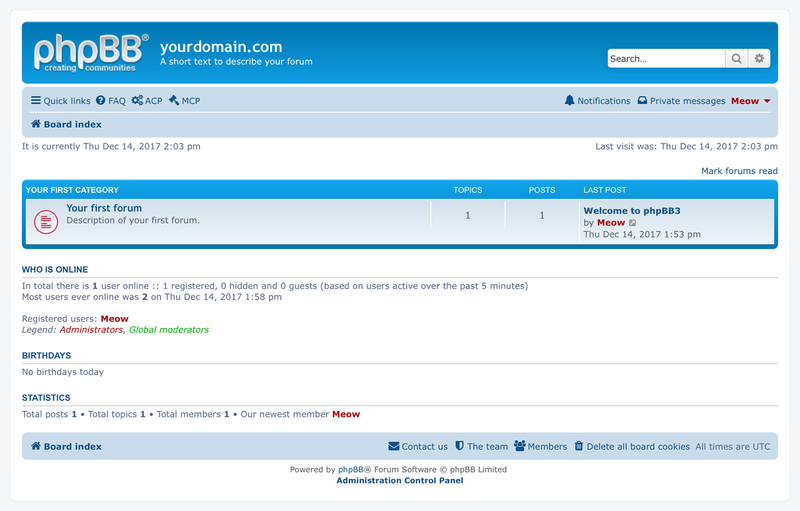 The latest version of phpBB now supports PHP7.2 and comes with HTML5, CSS3 responsive design. The software also offers COPPA registrations, primarily used in the United States that requires parental approval for users under the age of 13 years old. To make sure everything runs smoothly, phpBB offers clear user roles like global moderators and forum moderators who help maintain the order by assisting users and enforcing rules. On that note, moderators have the ability to lock individual posts so that the original author cannot edit it any longer or can split a topic into two separate topics to improve communication.